Nike is quickly expanding its line of wearable tech products with two new additions: Nike+ Training and Nike Hyperdunk+. The Nike+ Training and Basketball shoes are embedded with pressure sensors in the sole that track intensity and movement. 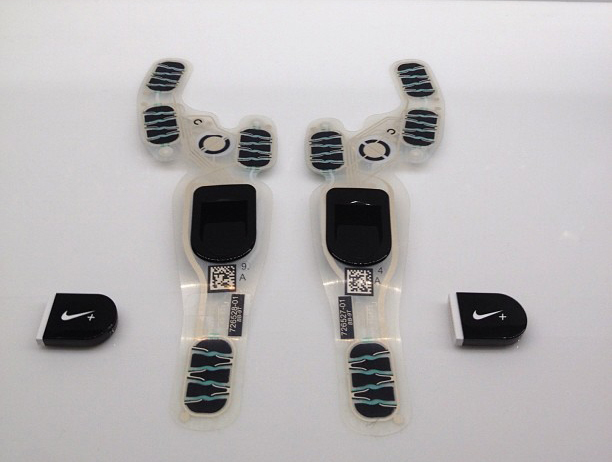 The collected data is then wirelessly transmitted to your phone and feed into the Nike+ interactive application. The Training system allows users to follow onscreen workouts, collect their performance metrics and share it with friends. It claims to have a gaming component but other than competing and sharing data with friends, it is not clear what other gaming methodologies are being used to craft the user experience. The Hyperdunk+ pretty much gathers the same data but the user experience is designed to improve performance based around specific skills (how high you jump, how hard you play) necessarily for basketball. Players can even record their plays and superimpose their live data on the video. Both products will be available June 29, 2012.